The PhoenixMars Lander is set to scope out Mars? frozen pole for life-supportingconditions next May, but researchers are predicting a tricky soil-samplingmission. If thespacecraft?s rockets don?t blast the topsoil away, the exhaust fumes couldcontaminate it with fuel. Or, Martian surface winds might simply blow away thesamples before they can be dumped into the lander. To combatthe looming technical troubles, a team led by engineer and atmosphericscientist Nilton Renno at the University of Michigan has developed severalunique tests to prepare the three-legged spacecraft?s operators for success. The lander?s first hurdlewill be to avoid? blasting the icy soil away when it touches down, Renno said. ?Phoenixwill be traveling around 10 meters per second when it lands, so it?s going touse thrusters to soften the landing,? Renno said. The price for this relativelysoft descent is that the thrusters will be ejecting exhaust at more than twicethe speed of sound, he explained. To measure the effects ofthe 12 thrusters on Mars? surface, where gravity is just 38 percent as strongas on Earth, Renno and his colleagues created a glorified shower stall armedwith a downward-pointing air cannon. At the stall?s base, they placed sawdustand crushed walnut shells to mimic the Martian soiland blasted it with air for several seconds to simulate the thrusters? blasts. ?Thewalnuts help us simulate not only the weight, but also the density of thesoil,? Renno said. ?It?s going to be pretty darn close,? he said, when thelaboratory performs the experiment again under vacuum conditions at NASA's Ames Research Center in California. So far,Renno explained, the results show that if the lander travels horizontal to theground whilelanding, it should leave an intact ?wake? of soil for chemical,conductivity and microscope analyses. Another benefit is that thruster exhaust wouldspread over a larger area and cut down onany soil contamination that would be more concentratedin a vertical landing. Assuming a top-notchlanding, Renno said Phoenix?s next challenge will be for its 8-foot robotic armto collect and fully deliver the samples of icy soil. 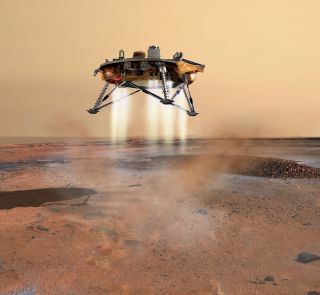 Mission engineers had planned to dump the scooped-up samples into the lander?smini-laboratory from a height of about 4 inches, but Martian windsof up to 11 mph are expected at the landing site. Renno thinks shrinking thatdistance to about 1.2 inches from the drop-zone should address the competing concerns,but the team is planning tests in a wind tunnel to be certain. In the upcomingexperiment, they?ll drop bits of ebony, bamboo and balsa to represent Martianice, soil and dustin the wind and determine the optimum drop distance using high-speed cameraimages. Renno said addressing suchproblems may seem simple, but the number of issues to fix add up quickly. ?Withmissions like these, there are so many things to worry about,? Renno said. ?Butyou solve them one by one and get it right, until it?s perfect.? The team?sexperiments were funded by NASA as well as Lockheed Martin, the spacecraft?smanufacturer.